For venturing into Iceland’s Highlands, you need a vehicle as rugged as the terrain. Our Iceland specialist, Kelly, tells us about a luxury 8WD adventure. Completely custom made to tackle Iceland’s back country, the 8WD truck was first showcased in June 2014, and has been making a big impression. 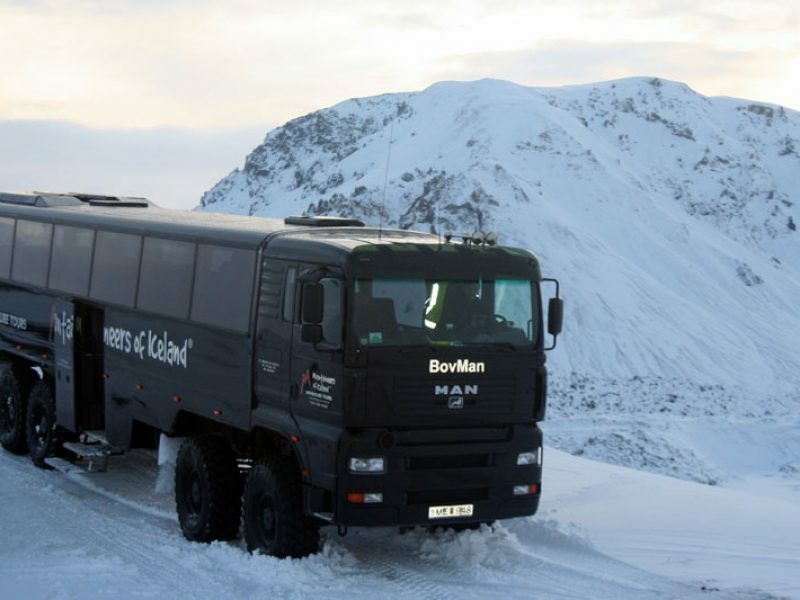 It’s a unique and exhilarating vehicle offering a great way to explore Iceland. The vehicle started life as the base of a Military Missile launcher, which was extended by 4 metres and blended together with a MAN motor truck cab and 49 seater bus. We’ve watched the evolution of this monster truck, and when Debbie and I travelled to Iceland in November, it did not disappoint. My high expectations were instantly exceeded the moment I saw it! As I climbed aboard, you could feel the extreme level of excitement around the group. Once inside I found the truck very spacious with large clear windows to see all the mesmerising scenery. Although the truck could seat many more, the maximum size of a group on this trip is 29 people – so there’s always plenty of room. The first day our journey was through the Highlands, heading for Landmannalaugar. The truck was tackling the snow covered rugged terrain effortlessly and the ride was much smoother than I thought it would be. When the roads got worse, the driver would remove some air from tyres to make them softer. These mega 54 inch winter tyres can go down to 4 or 5 PSI to glide along extreme snow. Up and down the steep slopes, we always felt safe in the truck, whether we were driving on snow, ice or rocks. Nothing stands in the way of this 8 wheeler. The second day was spent exploring Thorsmork valley, where we crossed several rivers. Just when I was sat thinking we might have to stop, the truck rolled through with no problem. Travelling in this capable truck enabled us to view some thrilling sights – dramatic mountain drops, frozen lakes inside calderas and snow scattered lava fields – that you just couldn’t get to on land any other way. Knowing that we were the only group in the area that had access to the natural wonders was truly surreal and unforgettable. Find out more about our range of holidays in Iceland or contact or team to start planning your adventure.